Apple CEO Tim Cook unveils the Apple Watch and the iPhone 6 and iPhone 6 Plus. If it seems like big business is getting bigger, it is. Over the last two decades, the largest U.S. companies have grown faster than the economy as a whole. And it’s the biggest of big businesses that are making up a larger and larger share of the growth. The best list of “big” businesses is the Fortune 500, which ranks the 500 largest U.S. companies by how much money they take in (gross revenues, to use the accounting term). Verizon, for example, ranked 16th in the 2014 list. Apple ranked fifth. The overall revenues of Fortune 500 companies have risen from 58 percent of nominal GDP in 1994 to 73 percent in 2013. While that ratio of big business revenue to GDP has ticked down over the last two years, the upward trend over two decades is clear. The Fortune 500 list has been published annually since 1955, but the magazine changed its methodology starting with the 1995 list to include service companies, not just industrial ones. Each Fortune 500 list uses company financial data from the previous calendar year; so the 2014 list uses 2013 data, for example. The data used here starts in 1994, and is compared to the nominal GDP figures for that year. Why compare revenue to nominal GDP, which is not adjusted for inflation? Typically, when GDP is cited, it’s in real, or inflation-adjusted, terms. But because Fortune doesn’t adjust company revenues for inflation when it does its ranking, it makes sense to use nominal GDP here. 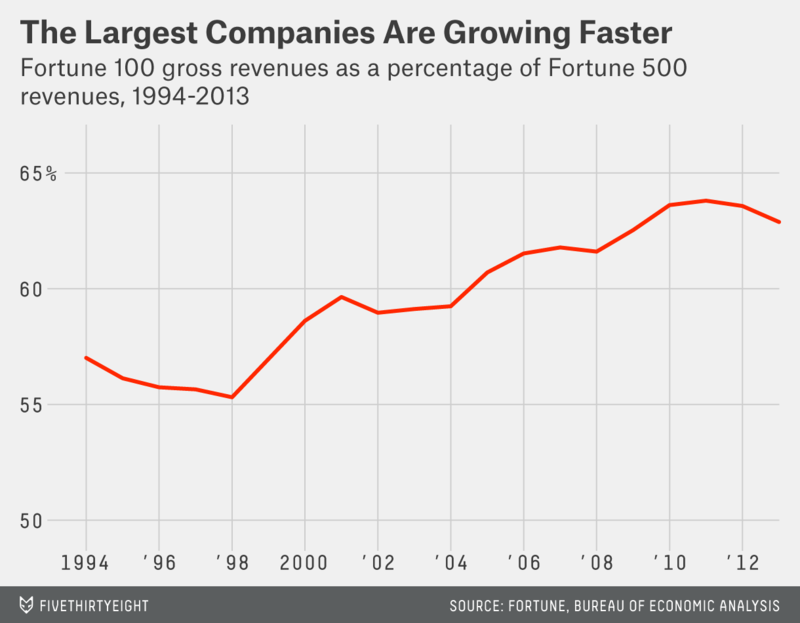 As big business gets bigger, the biggest businesses are growing even faster. The Fortune 100, or the 100 companies with the highest revenue, have seen their proportion of nominal GDP rise from about 33 percent in 1994 to 46 percent in 2013. As a share of all Fortune 500 revenues, revenues for these top 100 companies were up to 63 percent in 2013 from 57 percent in 1994. 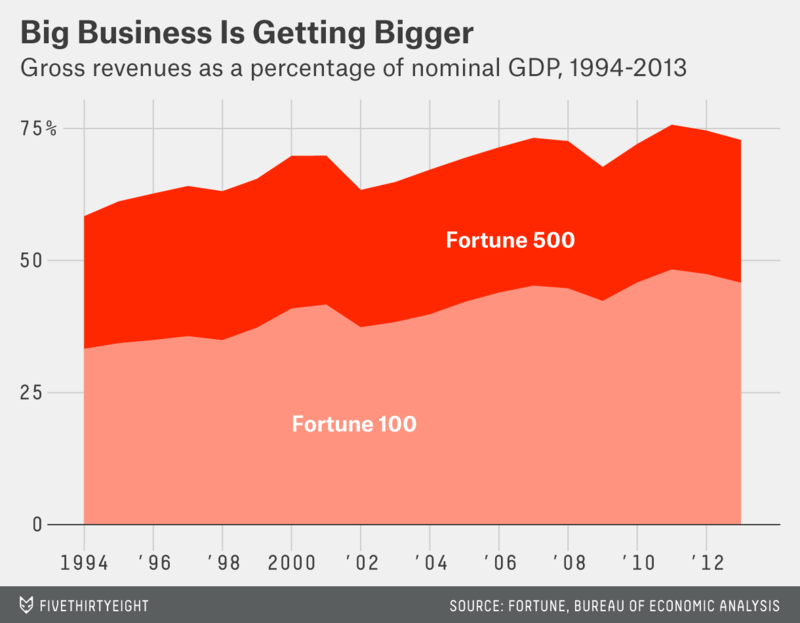 If big business is getting bigger, it’s not necessarily getting more profitable. The ratio of Fortune 500 profits to all corporate profits shows a cyclical pattern. That is, they are very high in good years, and plunge in bad years, but with no real upward trend. It’s not clear exactly what is fueling the overall growth of top Fortune companies, but there are a number of popular views. With a slew of mergers and acquisitions — like the Verizon-AOL deal — big businesses might be snapping up or joining with rivals, and that corporate consolidation may have led to a concentration of market power. That’s the skeptical-of-business view. Alternatively, big U.S. companies might just be riding a streak of legitimate success. Apple had the most profitable corporate quarter in history because people really like the company’s products. The U.S. boasts many of the world’s best-performing companies, so it’s not a stretch to think big business would outpace the economy as a whole. That’s the pro-business view. And there is a third explanation, which does not point to growing monopoly power nor to pure excellence: globalization. Global trade has exploded in the last two decades. And these giant U.S. businesses might just be leveraging their already large scale to grow further in overseas markets. Apple’s record-breaking earnings occurred during the company’s fiscal first quarter, which ended in December.